HEALTH MINISTER SIMON Harris has said he was not aware of the cost implications for the new National Children’s Hospital in the run-up to last year’s Budget. 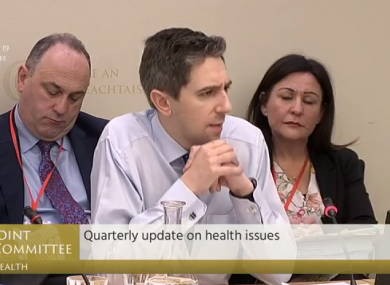 Speaking at the Oireachtas health committee this morning, Harris said during budget negotiations he was unaware of the cost implications the hospital would have despite their being an awareness across the Government that the project was coming in over budget. “I was actively seeking additional capital for the health department during budgetary negotiations,” Harris said adding that he didn’t negotiate specifically for the project. Labour’s Alan Kelly said it was “beggar’s belief” that officials from the Department of Health and the Department of Finance and Public Expenditure (DEPR) did not meet about the issue in the run up to the Budget. He asked how anyone could believe that health officials could not get a meeting with DEPR, while Budget negotiations were going on in parallel, seeing as this was such a “massive issue”. Kelly also told the committee that it was “utter garbage” that an DEPR official sitting on the board of the hospital development was not required to report their concerns to the Minster. Harris told the committee he was “frustrated” with the coverage the scandal had received adding that paper trails and testimonies show that no one was ignoring the issue. The paper trail that you have and testimony that you have from my officials, from members of the National Pediatric Hospital Development board, from the HSE and indeed from my own mouth at this committee last week show that not to be the case. Minister for Finance, Paschal Donohoe, said previously that the awareness of rising costs had started to build before November but that he was not made aware of it until then despite an official from his department being on the board. “I was not informed of the development of the issue, I do have an official on the board and that official was bound by the responsibilities that he has to the board,” he said. I wish it could be cheaper but I do. Because if I didn’t, the Government would not have pressed go to proceed with the construction costs. The issue also dominated Leaders’ Questions today, where Housing Minister Eoghan Murphy acknowledged the anger of the public. He told the Dáil the government was angry too that costs had inflated by so much. He said the government essentially had three options facing them when the full costs came to light. “One was to pause the project, meaning even further delay to a project which has been discussed for decades and which the Government is now implementing. The second option was to go out and re-tender the project, again meaning more delay and an even greater cost. The third option was to proceed with this project and pursue this hospital. That was the right decision to make. “If other people would have taken a different decision and put the future of this hospital in jeopardy, I would like to hear that. We believe it was the right decision to pursue this hospital,” he said. PwC’s review, commissioned to understand the reasons for the cost escalation associated with the new children’s hospital construction project, will now look at cost mitigation and value for money according to Harris. The revised terms of reference for PwC’s review, published yesterday, will also now deal with the accountability of relevant key party’s functions and roles but any sanctions made will be a matter for government. The review is set to be completed by 29 March. Speaking on Today with Sean O’Rourke, Minister for Social Protection Regina Doherty said in defence of Harris that “he did exactly what he was supposed to do for someone in his position”. “He was told at the time that it would take a number of months [to work out the exact overrun costs]. The earliest it came back to him was 9 November… he brought a very detailed memo to Cabinet on 8 December. There was overrun, but he didn’t know the extent of it. If it had been me, they would have asked me ‘who’, ‘why’ ‘when’, and ‘how much’, and if he didn’t have all the figures he’d look like an eejit. Doherty said that there was a ten-week period between August and September where commercially sensitive negotiations were going on with those involved in the construction. “I think Simon has been very clear that he is the Minister responsible for the Children’s Hospital, so there is political responsibility. We know what the overruns are, now we need justification… maybe they will be justified at the end of it. “There’s nobody walking away from this,” she said. Harris told today’s health committee that an early warning system would have helped significantly but said that going ahead with the project was the right decision for children. “Whoever is the health minister is 2023 will be very proud opening that hospital,” he said. Email “'Father Ted territory': Harris says he was unaware of the NCH cost implications before last year's Budget”. Feedback on “'Father Ted territory': Harris says he was unaware of the NCH cost implications before last year's Budget”.